Embroidery Stitches are more than just a straight stitch. Sometimes I forget that and just keep repeating the same basic embroidery stitch after another. The most common stitches that I use are the running stitch, stem stitch, chain stitch, and blanket stitch. Beyond that, I need a quick reminder that the needle and thread can do more than that! Finding good sources of stitches can take a bit of time, so after digging around for a bit- here is a list for you to use. Sher is a good friend of mine and she is the applique queen! Her designs are simple and sweet. Here you can find a little series on learning a few different Embroidery Stitches while stitching on an applique. The instructions are great and the stitches are super basic. 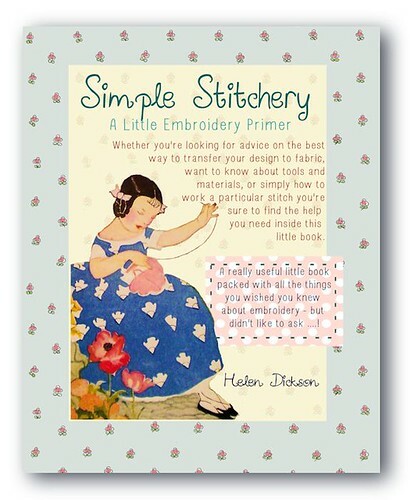 Perfect for the beginner embroiderer. 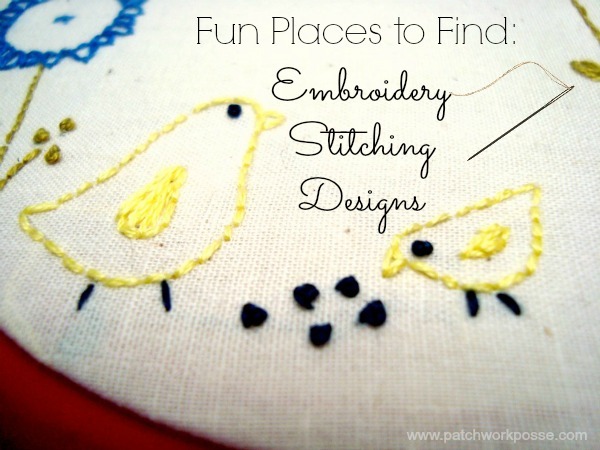 This site has a wonderful A-Z list of Embroidery Stitches! Along with the name, they do have a quick reference diagram…..so you won’t get lost in the search because you can’t remember the name. 9 basic embroidery stitches are listed on this site with a diagram to help show you what to do. Not fancy, but it totally does the job. 5 basic embroidery stitches — a great place to start for beginners. The Stitching Cow has some wonderful videos showing some different stitches- great for those visual sewers! Bustle and Sew has a brand new embroidery and stitchery primer that you can download for free. Lately I have found myself using more than two threads when stitching. I like the bulkiness of it, and it really hides my stitching mistakes a little better. If you are going for a more dainty style of embroidery, the less thread the better. Go for one thread and it turnes out super sweet and dainty. Also- what about stitch length when sewing? I have seem some mentions that 18″ was the length to cut your thread…..after trying that a few times I found that was too short. By the time you knot the end, fold over the thread at the needle and leave space for knotting the other end, you are out of thread! Try a few lengths and after a bit you will naturally start cutting your thread right where you like it. Out of all the Embroidery Stitches, What’s your favorite? My favorite is the buttonhole stitch. I love to use the buttonhole to stich down appliqué and if you use a long and short buttonhole it makes excellent grass! Thoroughly enjoyed the post. Eagerly anticipating what’s coming next.I would never have normally come here to read the blogs but I’m really glad I did. I will definitely be coming back. I love hand embroidery and applique. I’ve always enjoyed the buttonhole stitch but never thought about using it for grass. Great idea Kira! And here you’ve posted this great collection for me!! thanks for stopping by Emmy, and congrats on starting embroidery! You will find it so fun and enjoyable. Excited to start this sampler! I used to embroider and cross stitch in the decade of the 80″s! Then on to something else. But I love samplers. I’ve done several and am excited for this one. Love the videos of instructions for stitches. It’s been awhile. Thanks for the post. I love to learn embroidery stitches and the effects which can be created through them.